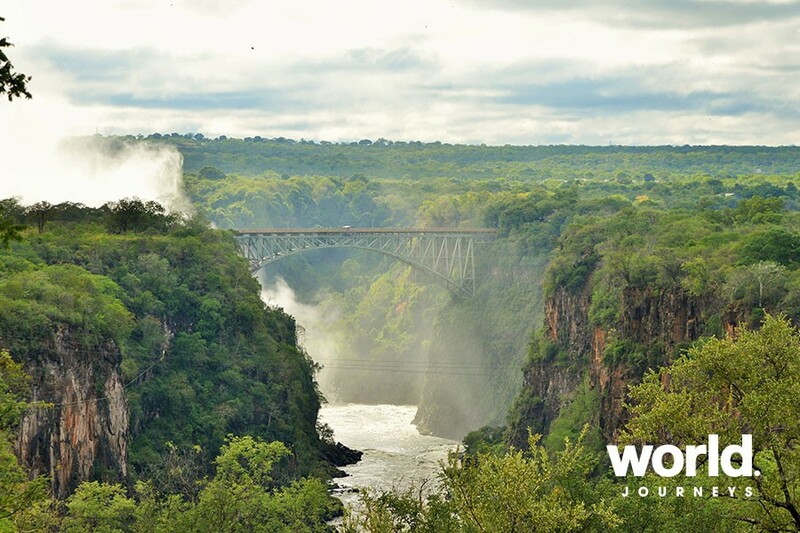 Begin your journey with a visit to the magnificent Victoria Falls! 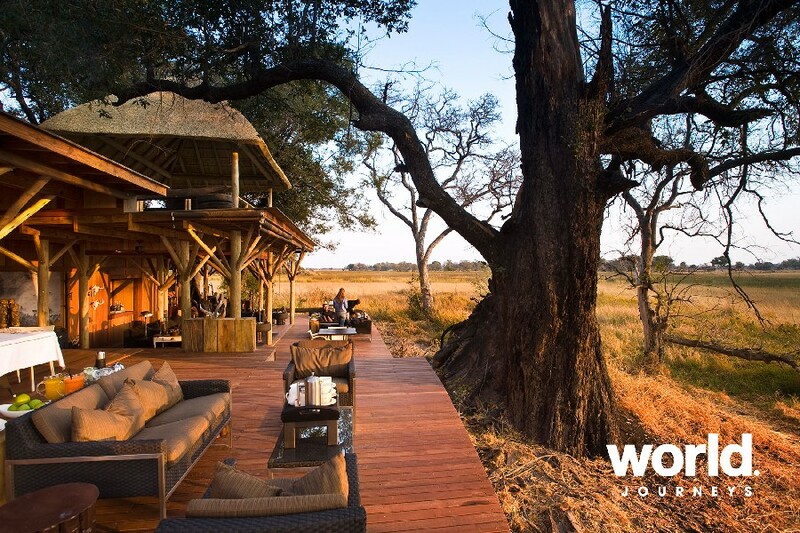 Then tailor your safari with andBeyond's exceptional Botswana lodges and camps. Include up to three destinations or spend more nights at one or two destinations: Chobe National Park, Savute National Park and the Okavango Delta. 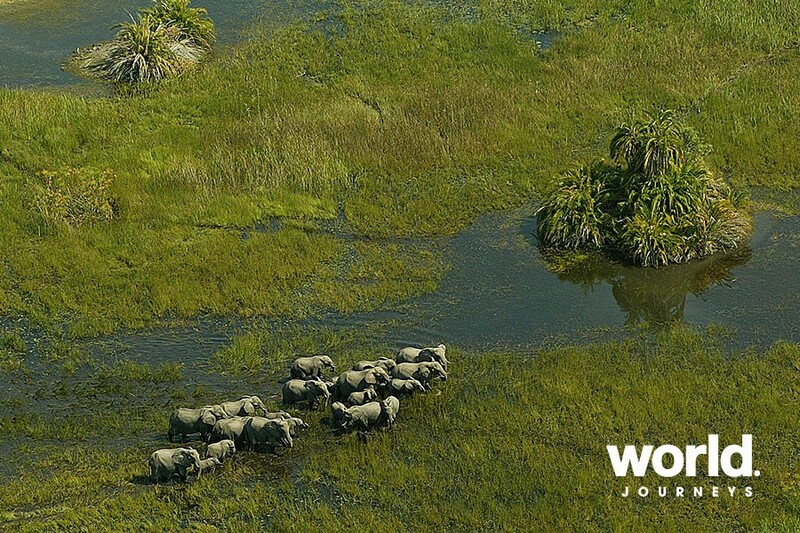 A wildlife enthusiast's dream, Chobe National Park is one of the top wilderness reserves in the world. From the striking Savute area to the beautiful Linyanti River, this vast landscape is waiting to be explored. 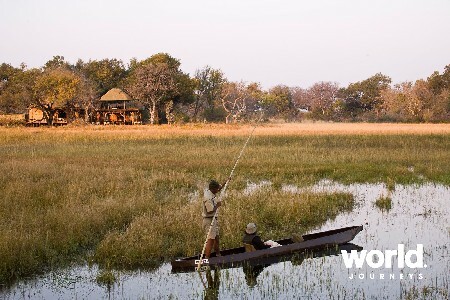 The Okavango Delta undergoes an almost magical transformation every year and is a truly spectacular sight. The vast floodplain hosts an enormous range of wild animals, including the specially adapted sitatunga and lechwe antelopes. Day 1: Victoria Falls Arrival transfer Victoria Falls to your hotel. 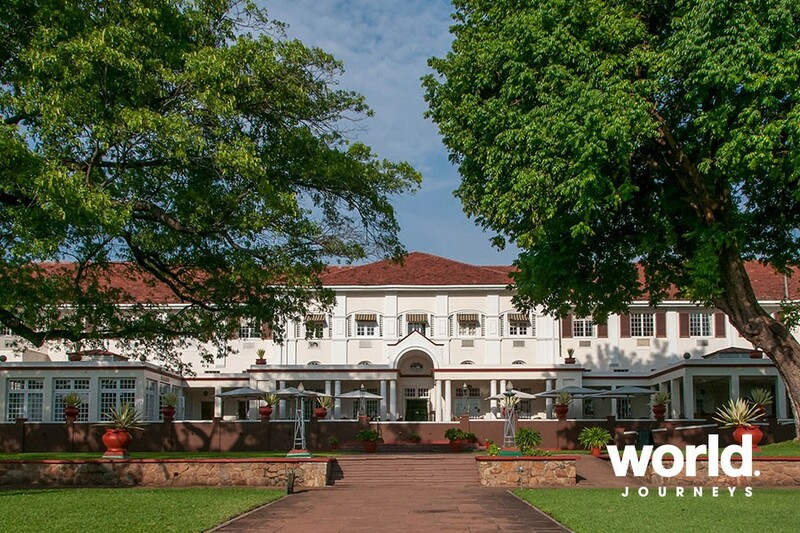 Spend two nights at the legendary Victoria Falls Hotel commanding a prime location overlooking Victoria Falls. Day 2: Victoria Falls Enjoy a private guided tour of the Victoria Falls. 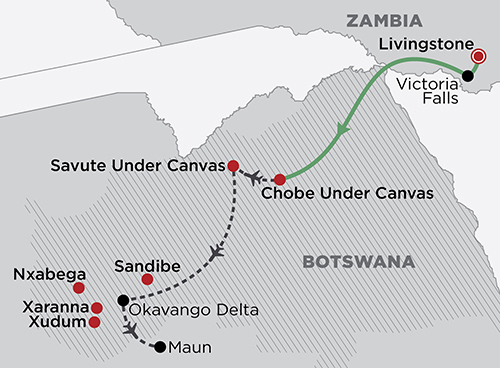 Day 3: Victoria Falls > Chobe National Park Transfer from Victoria Falls to andBeyond Chobe Under Canvas where you will spend the next two nights. 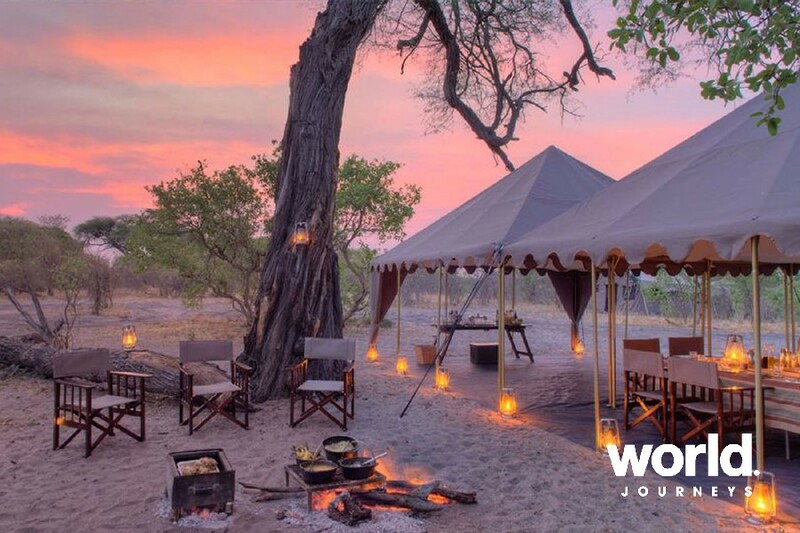 This fully serviced wilderness camp offers spacious East African style safari tent with comfortable beds, teak furniture, quaint bedside lamps and en suite bathroom including a flush loo. Day 4: Chobe National Park Morning and afternoon game drives in open 4x4 vehicles with guaranteed window seats and uninterrupted views offer the best opportunity to spot the Big Five. 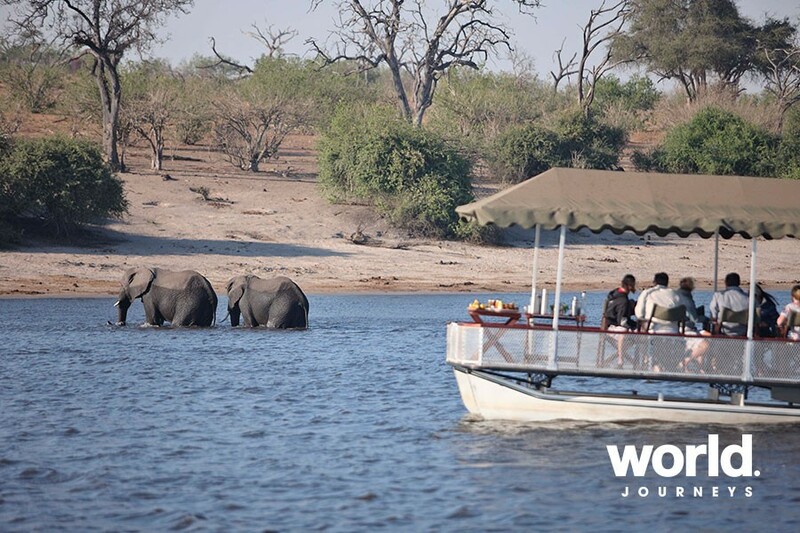 A boat cruise on the Chobe River should reveal a myriad of wildlife drawn to the water to drink. Day 5: Chobe National Park > Savute Light aircraft flight to Savute. Spend two nights at Savute Under Canvas. Savute, a remote and wild corner of the Chobe National Park, is situated south of the Chobe River. The area's main feature is the mysterious Savute Channel, which flows and dries up in a manner seemingly unrelated to the rainfall. Dry and arid for almost 30 years, animals in the area were sustained by artificial waterholes. With the Savute Channel having started flowing again in recent years, the region has undergone a startling transformation, reverting to its natural lush and marshy state. Large numbers of wildlife have been attracted to this rejuvenated wilderness haven. 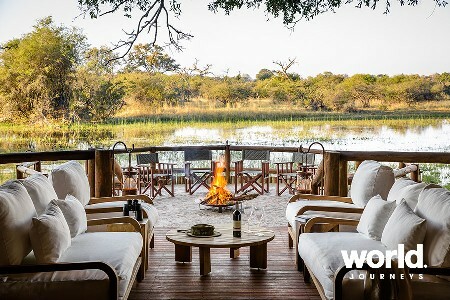 Day 6: Savute Channel At Savute Under Canvas your days are designed to thrill you with intimate wildlife experiences, and your nights to delight you with the romance of canvas under open African skies. Day 7: Savute > Okavango Delta Fly by light aircraft into the Okavango Delta, a maze of lagoons and waterways in the heart of the desert. 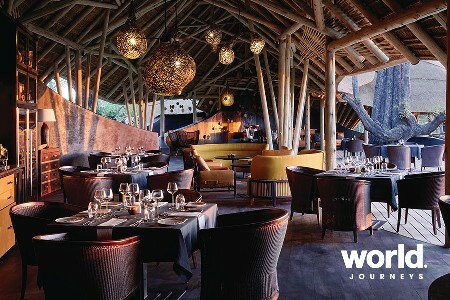 Choose three nights at one of four luxury lodges or tented camp to enjoy a full experience in this wildlife-rich hotspot of Africa: andBeyond Xaranna Okavango Delta Camp, andBeyond Xudum Okavango Safari Lodge, andBeyond Nxabega Okavango Tented Camp or, for a supplement, andBeyond Sandibe Okavango Safari Lodge. 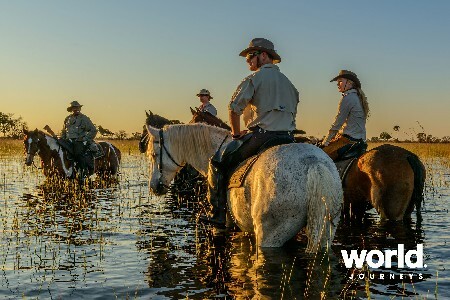 Days 8-9: Okavango Delta Activities during these wonderful days include game drives in open 4x4 vehicles, mokoro (dug-out canoe) trips on the waterways, bush walks, bird watching, bush breakfasts and sundowners. Day 10: Okavango Delta > Maun Light aircraft flight to Maun to connect to your international flights. Our Zimbabwe highlights - The history of the falls and experiencing the spray coming back up from the bottom. Because so much rain has fallen in the last 3 months the power of this water spraying back up meant parts of the view points were closed as you couldn't see anything through the mist, which fell back down as heavy rain. 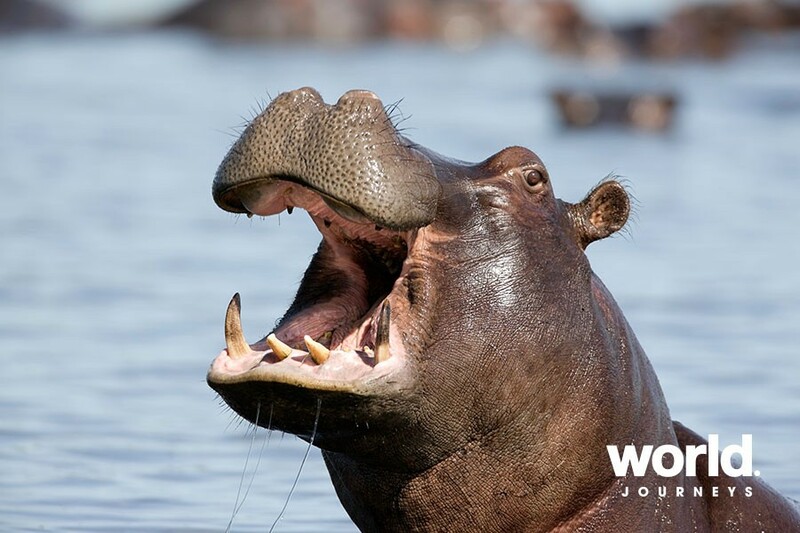 Our Botswana highlights - Chobe National Park: Our first day in a National Park and first look at so many animals on the drive through to our tented campsite - the animals were all there, you didn't need to search for them. Instead of a morning land game drive on the 2nd day we had a half day trip down the Chobe river in a boat where we were all provided with a high powered camera each on a stand that rotated 360 degrees to take as many photos as possible. At the end of the tour the memory stick was given to us loaded with all the photos we had taken - so many elephants spotted at the river with plenty of hippos. &Beyond Tented Campsite was a great way to start our African safari. Sandibe Safari Lodge: The afternoon our lunch was interrupted by a juvenile elephant that decided to enter the outdoor restaurant and destroy some of the furniture and joined his family that prevented us from accessing our room for over 1 hour. Xudum Delta Lodge: Following 4 female lions and 6 cubs on a hunt for food, eventually catching a warthog and demolishing it before our eyes - gruesomely exciting - one of the advantages of being able to travel off the beaten tracks to view this unlike the National Parks where you had to stay on the roads or tracks. Our whole time in Botswana was one of our favourite times and the organisation, service, food options and presentation, staff friendliness by the &Beyond company would rate as the best over the 5 weeks - the extras like coming to a open space on the afternoon game drives where we could watch the sunset with a bar set up to enjoy the daily sun downer.